From the moment you enter this gorgeous house you feel right at home. Greeted with a formal living and dining boasting two story ceilings as you enter the home feels like luxury. 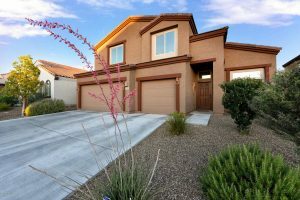 With an open floor plan, this immaculate home features a great-room style family room, large kitchen with granite, over sized island, staggered birch cabinets, breakfast nook. bar and den. There are four over-sized bedrooms including a true master suite measuring is 18 x 23. Custom back yard with extended patio and remote control roll down shades , synthetic grass and state of the art Jacuzzi with tons of privacy, you’ll enjoy every area of this home both inside and out! A three car garage offers ample parking and storage. And if that weren’t enough, there is also solar on property to keep electric costs as low as $19/month in high use season! With only 90 homes in the subdivision, Oasis Hills sits surrounded by mountains and natural desert. Only a few minutes from Twin Peaks Outlet Mall, golf courses, restaurants, hospitals, schools an hiking this area provides everything you could want for both entertainment and outdoor living. Located Only 1.2 miles from I-10 you have easy access to get anywhere! Written by Nicholle Bale on January 22, 2018 . Posted in Homes Coming Soon! I would like to know the cost and location of the house. Thank you. Hi Dulce. Nicholle will be in touch today or you can contact her at 520-599-2599 for more info on Crook Lane.